Giancarlo Stanton, Aaron Judge Defeat the Abomination of Desolation! 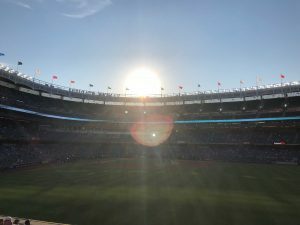 And so on a beautiful Spring May day in the Bronx the Yankees welcomed the abomination of desolation (AKA the Bawstahn Red Sawks) to the Stadium for a three game set. The Yankees come into the series having won 15 of their last 16 games, making them hotter than Kate Beckinsale in Pearl Harbor. And that’s pretty damn hot. The Yankees started Luis Severino (5-1 2.11) and the Red Sox Drew Pomeranz (1-1 6.14). Neither pitcher figured in the decision. The Yankees got on the board first in the bottom of the second when Stanton hit a line drive into the left field stands. 1-0 Yankees after two. In the bottom of the fourth Stanton hit his second home run of the game, this time to right field. 2-0 Yankees after four. In the top of the fifth Bahstahn got a run back. Former Yankee Eduardo Nunez led off by striking out but reaching first on a wild pitch. He then stole second. Mookie Betts singled. Andrew Benitendi then singled him home. 2-1 Yankees after 4 1/2. Severino was dealing and left the game after six innings having fanned 11 Red Sawks. David Robertson came in and promptly blew the save. Eduardo Nunez singled, stole second and scored on a triple by Mookie Betts. 2-2 after 6 1/2. In the bottom of the seventh the Yankees took the lead back. Neil Walker, pitch hitting for Tyler Austin, doubled. Gleybar Torres then walked. Both advanced on a balk. Aaron Judge singled to left scoring Walker. 3-2 Yankees after 7. And that was the final score. Despite blowing the save Robertson (3-1 2.12) was credited with the win. Heath Hembree (2-1 4.14) got the loss for Bahstahn. It was anabolic steroid appreciation night at the stadium. All fans 14 and under were given a syringe. As a tribute to steroids former Red Sox slugger David Ortiz was brought out to home plate to show the kids the proper method of shooting up. He exploded. All that was left on home plate was a stain. I tried but my heckle of “John Brennan is attempting a deep state coup of a constitutionally elected president!” didn’t fire up the crowd. What can I say? Noo Yawk. So many Democrats. Son, that’s my line. Don’t step on my toes. Alright. That’s different. If you had said “John Brennan” well, that’s my line! It’s a good thing you didn’t mention John Brennan. That’s my line! “A Place Called Waco” by David Thibodeau. Because the American government, like all totalitarian regimes, is more than happy to kill you. And so my record so far in 2018 is 1-0. My next game is Friday, May 11th against the Philadelphia Kansas City Oakland Athletics. You had me at 150 RBIs.